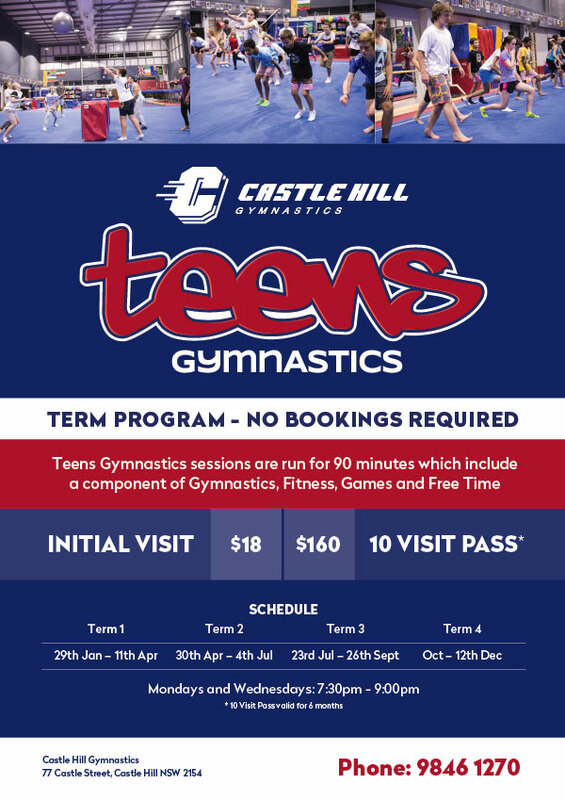 Our teens session are the perfect opportunity for ages 12 – 17 to come in to our state of the art facility and work on building gymnastics skills from the basic round off through to the more advance tumbling skills. This program provides the perfect balance of fitness training and fun. Teens Gymnastics sessions are run for 90 minutes which include a component of Gymnastics, Fitness, Games and Free Time. After the warm up and stretch, there is 20 minutes of Boot Camp style Fitness with a qualified Personal Trainer from Castle Hill Fitness Centre, 20 minutes of Gymnastics with qualified Gymnastics coaches, and then 30 minutes of Free Time at the end where the teens have a chance to use the Gymnastics Centre’s facilities which include floor space, trampolines and the foam pit. Interested in joining? Complete the Gymnastics Enrolment Form and bring it with you to your first visit!